Fresher Products - When it comes to product freshness choosing quality usually trumps big-box store bulk alternatives. Keeping the Cash At Home - After the sale is made, local businesses return almost 45% of earnings right back into the community where you live versus 13% when you shop big box or chain stores. Superior Service - Local grocers enjoy the opportunity to provide first rate service to guests shopping the store. When is the last time you were helped with your groceries at a big box store? Proximity - For many living in outlying communities the trip to a large retailer means a serious investment of time and money. Why waste either when similar items can be picked up just blocks away? More Local products - As independent local retailers we carry more local products than the big box and chain stores. Keep Our Community Unique - Locally owned businesses cater to the cultural base of the neighborhood it serves. Residents can find new adventure in a familiar environment. Where we live, shop and play is the foundation of our community. Unique businesses are vital to the diverse character of our neighborhoods. Get Better Service - Local businesses tend to hire people with some knowledge of the products they are selling and provide better customer care by giving special attention to each patron they serve. Reduce Environmental Impact - Locally owned businesses are usually found in thriving neighborhoods or city centers as opposed to developing on the border. They along with local residents are more likely to purchase local, resulting in less travel and reduced air pollutants. Invest in the Community - Local business owners live in the community they serve; this lessens the possibility of moving and increases their assets in the future of the community. Create More Good Jobs - Local businesses provide jobs for residents and are one of the largest employers nationwide. Encourage Local Prosperity - Research indicates that entrepreneurs and experienced workers will more likely live and invest in communities that preserve the characteristics of locally owned businesses. Put Your Taxes to Good Use - Local business anchors the neighborhood infrastructure and supports the city and county tax base. Because they don't outsource, dollars are recycled back into the community. This adds value to the neighborhood by increasing its income. Support Community Groups - Local businesses on average support non-profits at a higher rate than big businesses. They are more likely to give back to the community and encourage entrepreneurial growth. Buy Local - Support Your Town - Local business strengthens the economic base of every community. A good deal of the dollars spent with local businesses is used to make purchases from other local entities - creating a domino effect that can preserve a neighborhood even in an economic slowdown. Think about it: would you want $13 or $45? For most people, that is a "no-brainer." Still, we have people shopping at the big box stores taking no thought for how it affects the community feel of our neighborhood. 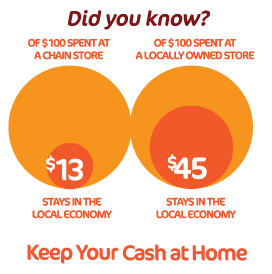 If you spent $100 at a local grocer, $45 stays in the local economy. In the big box stores only $13 of that same $100 would stay to promote your family and friends businesses.